Such a dilemma. You have a dog that loves to walk, but he's so powerful that a standard leash and collar won't work. Relax, don't worry. Just grab a supercollar. 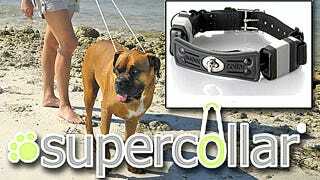 The $40 supercollar has a three foot retractable leash made of wound steel. The steel cable attaches to the collar in two places for added strength. It supposedly can withstand "100s of pounds of tugging pressure."